The Patriots are off to a good start while playing their worst, probably ever, under Brady’s watch. He is being hit left and right due to the awful offensive line. The run game has also struggled at times having these line issues. The Pats have taken advantage of the turnovers their defense have created while the Chiefs are the worst in the league with turnover differential and that has shown to hurt them in their games and stall any momentum the offense gains. Brady and the passing game has yet to climb above 250 yards and that will continue with Tamba Hali chasing Brady around the pocket. Even without Charles, the Chiefs running game still dropped big yardage on the ground. Charles is still a questionable return coming into Monday but expect the Chiefs to turn their ship around at home. It’ll be close but with the Chiefs getting +3.5 at home, that’s your best bet. Take the Chiefs to win with the points but not knowing if Charles is going to be in the game, it might stay in the Under. Chiefs 24-20. The Chiefs should get on track with a win and so to will my handicapping. Good luck everyone. So I was completely wrong about Thursday nights game. The exact opposite happened and well, you win some and lose some. Btw, for-warning you, I started to write reviews for the games this week but was extremely busy towards the end of the week and got 2 lengthy ones done. 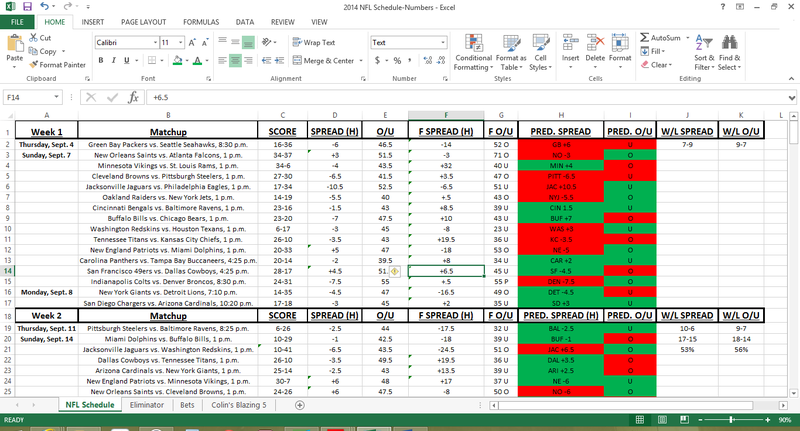 The rest will be quick blurbs and my predictions with the spreads and overs/unders. I hope you understand. Welcome to the game of bottom feeders. Both are reeling from loses last week but also trying to shake their persona this year of being a bad team. The Dolphins seem like they are trying to shake free of their “franchise ” QB. Reports have been that the Dolphins are starting to lose patience with Tannehill, who hasn’t been playing like a franchise QB since he was drafted. Now in his 3rd year, he still doesn’t look like he can lead them to the post season even with a guy like Mike Wallace as a legit deep threat and a half decent running game with Knowshon Moreno and Lamar Miller. Their defense hasn’t been too bad either so there is only one explanation, #17. At this point, Tannehill’s career numbers are the same averages as his predecessor Chad Henne, except Henne could drive the ball down field and averaged more yards per pass with less of a receiving corps. Tannehill gets the start Sunday but he was a whopping 21/43 last week and that’s not going to get it done if he plans on keeping his job. Oakland on the other hand doesn’t even have a running game they can rely on when the passing game isn’t working. MJD is hurt, DMC isn’t the back they hoped for, averaging 3 or less yards per run and they let Rashad Jennings go to the Giants who is now having a great start to his season. However, the Raiders take some sort of momentum into the game Sunday after keeping up with the Patriots last week. The Raiders only had 3 drives of 50 or more yards but none over 57 and 2 just had 50 yards. Outside of those 3 drives they had drives of 20, 26, 8, 29, 9, & 1 yard. They even started that 29 yard drive in Patriots territory. I hate hypotheticals but if they were to turn that 29 yard drive into a TD instead of the FG they got, we’re talking about a different game here, a 3 point game. So while both defenses were tough, the Raiders hung in there with one of the best teams in the league with, arguably, one of the best QB’s the league has ever seen. Their defense played well on the road, look for them to play well in London. Hopefully Carr will continue to improve and start making himself look like a gamer. Also take into account that the Raiders are in London already, and the Dolphins are still practicing in the states. For the Dolphins to come over so late, look for them to have some serious troubles adjusting once they land and start to prepare for the game. I think the Raiders win, easily covering the points +4 but in the Under. Raiders 24-10. This will be painless. Fitzpatrick showed he can still do things with his arm, having his first 250+ yard game this year (289). He still threw 3 picks though. The Texans defense will trouble EJ so much that they implode. The Bills and Texans haven’t been that great either in their 3 games, who both showed their true colors last week. Take the Texans at home with the points, in the Over. Texans 24-17. Locker is out for the Titans so Charlie Whitehurst gets the nod. The Colts tore up a bad team in The Jags last week in Jacksonville. luck set a career high in completion percentage with 79.5% while throwing for 370 yards and 4 TDs. Look for much of the same in this one especially being in Indy. Take the Colts with the points to blow out the Titans in the Over. Colts 31-17. Steve Smith Sr gets a chance to show his old team why they shouldn’t have let him go so easily. He’s been a big deep threat for Flacco early in the season. Cam shows that he didn’t need a top paid receiver to do well, as his new fav is Kelvin Benjamin. It will be a tough and physical game. Look for the Ravens to shut down the Panthers non existent run game and force Cam into mistakes. Ravens will take this one at home but take the Panthers for the points in the Over. Ravens 24-21. The Buccs are still having trouble getting any consistent play from the QB position. They’ve had limited success from their RB Rainey but he is prone to fumbling. The Steelers have found a gem in Le’Veon Bell who leads the AFC with 305 yards rushing and average per carry of 5.9. Blount gives a great compliment option who can break out for big yardage as well. Take the Steelers to pound the Buccs with the points in the Over. Steelers 31-17. The Lions are a totally different team on the road. That has carried over from the last few years. The Jets have had a tough schedule so far this year. Sunday won’t be any different. Geno is in charge of the offense but still needs to make better decisions in tough spots. There will be some offensive troubles in this one. The Jets will have a hard time handling the offense the Lions will drop on the,. Take the Lions to win with the points in the Under. Lions 24-17. The Jags pulled Chad Henne and altered their Blake Bortles plan by putting him in and starting him Sunday. Bortles looked fairly good in relief duty throwing for 223 yards, 2 TDs, 2 picks. Phillip Rivers has had a great start throwing 913 yards, 7 TDs and just 2 picks. The Jags have a new starter but that won’t help all of the yards their defense gives up. The spread is just too big, so take the Chargers to win in the Over but take the Jags for the spread. Chargers 31-20. The Vikes also put their rookie in last week but due to injury to Cassel (broken foot). Adrian Peterson. Is still out but Asiata has been a decent fill in. The Falcons also seem to have the road bug the Lions do, losing their only road game in terrible fashion. Matt Ryan won’t have another tough road game this week and will lead the Falcons to a road win with the points and but in the Under. Falcons 28-17. The Eagles get a tough test on the road against a very strong Niners defense. The Eagles has a hard time getting into a groove and keeping it all game long. The Eagles have had a tough time getting the run game going which will continue to struggle Sunday. The Niners will take advantage of that and after losing to the Cardinals last week, and the Bears the week before, you better believe that Harbaugh won’t let them get into his first 3 game losing streak since taking over. Extra motivation because of that will get a 49er win with the points and in the Under. 49ers 31-17. The Saints could easily have been 3-0 but have not held offenses well. This may be much of the same, allowing a bunch of points. The Saints don’t particularly cover spreads on the road so easily but Dallas has issues on offense that tends to stall for big stretches during games. They barely pulled off a win against the reeling Rams. Look for the Saints to hit a grove and finally prove that the Cowboys defense has been a fluke. Take the Saints to win with the points in the Over. Saints 35-27. Check out the blog tomorrow for my Monday night game prediction a preview. Good luck everyone. The Last meeting between the 2 the Kirk Cousins and the Redskins were in shambles, a 7 game losing streak. well they lost to the Giants making it 8 in a row. The last 3 losses were under Cousins, the first 2 when he took over he was good and ok, keeping the games close. He stumbled greatly in the season finale against the Giants, losing a fumble and throwing 2 picks. This year he took over early on in week 2 and played amazing and won while coming into Philly with the Desean Jackson return and played out of his mind with career highs in completions, yards and TD’s. He gave the Redskins a fighting chance and kept them in it until the end by limiting mistakes (just 1 INT in 48 attempts). The Redskins run game did ok with 84 yards but it only drew 3 yards per carry and the air game was the one that stole the show. The Redskins did a lot of good things under Cousins, more first downs, more possession time, more offense yards overall, more plays, better 3rd down conversion. The penalties were ridiculous, 10-131 but the Eagles also had 9-70. The 2 penalties that the Redskins committed were the pass interference calls of 40 and 21 yards. The first of 40 yards set up a FG and the second of 21 help set up their game winning TD. Granted it was a bitter divisional rivalry and D-Jack’s return to Philly party but the things that kill huge offensive games for teams are bad special teams, turnovers and penalties. The Redskins failed in all 3 but more so evident in the penalty department. The Giants came off a much needed win against Houston last week. Surprisingly, Fitzpatrick drove the ball down the field a bit (289 yards) but a usually conservative QB, threw 3 picks to just 1 TD. The Giants had more first downs, possession time, less penalties, less turnovers and pounded the ground for almost 200 yards. Eli had a great day going 21/28 for 234 yards and 2 TD’s. The Giants went 5-7 in the red zone, scoring 3 FG’s and 2 TD’s however lost a fumble at the 4 yard line and fumbled a FG snap which caused a turnover on downs. Snapper Zak DeOssie pitched a grounder back to the holder which skipped under his hands. They recovered and nicely for the win. Rashad Jennings played out of his mind, having a career day with career highs in carries and yards. This game will be a real test for the Giants defense as they are a below average defense. The Redskins are on of the better defenses in the league and is even 3 in yards allowed on the ground. The Redskins will be too tough for the Giants on offense and will put massive amounts of pressure on Manning, possibly turning him back into a turnover machine. That will have to be seen though since the ‘Skins have just lost DeAngelo Hall for the year due to his recently torn Achilles. Take the Redskins to get the win with their tough defense and big time offense, with the points -3.5 in the Over. Redskins 31-20. For those of you who may read my “Picks & Predictions” columns from week to week, I’m sure it’s tough to sift through what I got right and what I got wrong. So far this week, I have 87% WINNERS!!!! 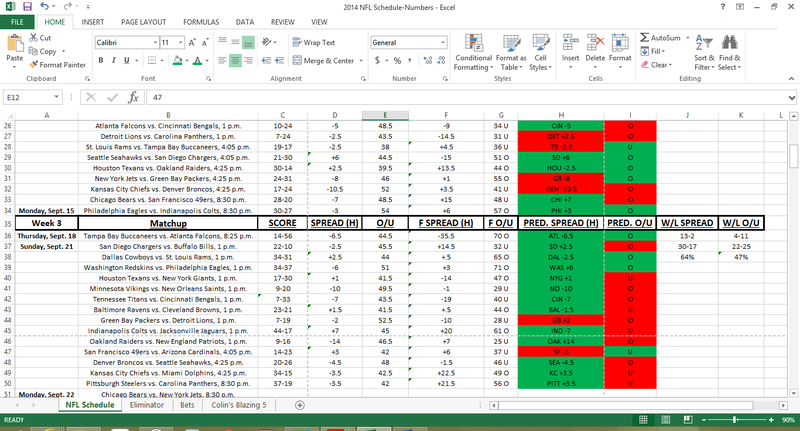 Below are the games, outcomes, the spreads, over/under numbers and my picks and their outcomes. This log shows week 1 until Sunday night of week 3. I will post the final log of outcomes from the week on Tuesday every week, just so you can see how I did, especially if you took my advice. I also log Colin Cowherd’s Blazing 5 picks, if the Sharpes agree with him and the outcomes for them both. Colin picked around 70% winners in 2012which is an astonishing number but is still overall about a 52% winners picker. It’s still nice to hear his advice since he spent some of his career in Las Vegas during his career and always gives great insight. Enjoy and seriously, if I can keep this up, I will need an 800 number and start charging for my advice! My picks today went 12-2 against the spread. I also won the Thursday game. So far 13-2, 87% winners for the week! Where else can you get picks like that for free? From me! Check it out, I published this 13 hours ago. Week 3: Sunday Games Preview, Game and Spread Predictions.